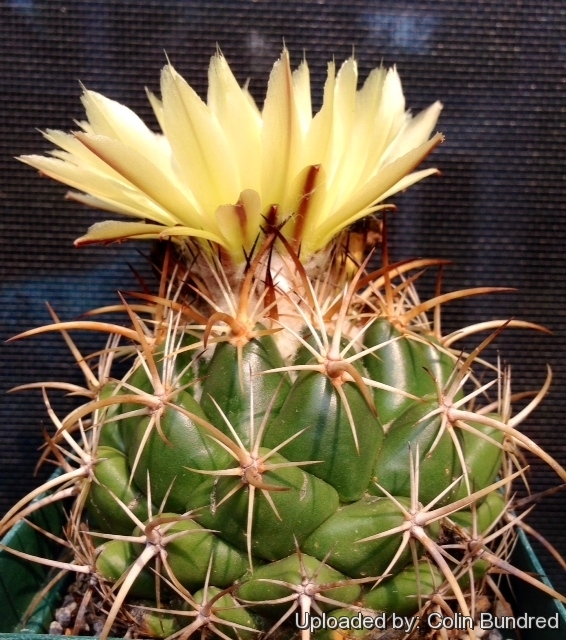 A mature specimen showing the typical central spines of an older plant as well as the flower. Origin and Habitat: Mexico, Puebla (Zinacan-tepec, Coxcatlan, San Jose Tilapa, San Gabriel Chilac ) and Oaxaca (Teotitlan del Camino, Cuicatlan, San Juan Tonaltepec.). Altitude: Around 2000 metres above sea level. Habitat: It dwells on foothills and ridges on gravel, alluvial terrain often on limestone. 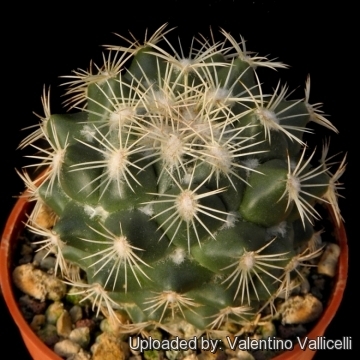 Description: Coryphantha calipensis is a low branching cactus forming more or less compact clusters with age. It is one of the most peculiar coryphanthas with pineapple appearance. This species is dimorphic with distinct young and mature forms. 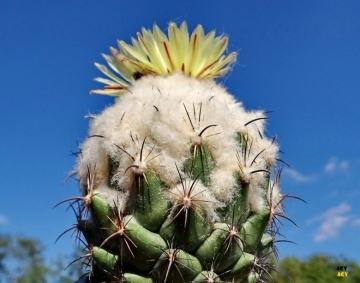 It passes a purely radial-spined youth stage with short tubercles, but develops central spines and long tubercles as it ages, giving the plant its characteristic appearance. Stem: Almost globular to slightly elongated, 7-9 cm high, 5–9 cm in diameter blue green, greyish green or olive green, apex rounded very woolly. Tubercles: Prominent, set in 5 and 8 series, conical, rhomboidal at the base, appressed to body with their apexes facing up, 2,5-3 cm broad, 2 cm long, with a deep woolly furrow. Axils: With white wool, more dense at the top. Areoles: Circular to oval, 2 mm in diameter, woolly in youth. Radial spines: (8-)10–13(-16), 7-8 of them radiating, horizontally arranged, straight to slightly curved, 1-1,2 cm long, hyaline, white, the other ones longer at the upper part of the areoles, straight, more densely set, dirty white with dark tips, longer, up to 18 mm. Central spine: 1 to 3 longer, one dominant, subulate, curved down-wards to almost hooked, basally yellowish-white with brownish to almost black tips, becoming grey. The 1-2 supplementary centrals (if present) are straight or slightly curved to the side and somewhat protruding upwards, thinner and shorter. Flowers: 6-7 cm in diameter, whitish-yellow to lemon-yellow, stamens red, style with 8 yellow green stigma. Fruits: Greenish-brown up to 20 mm long. Flowering period: Summer. 4–5 years from seed. 5) Cactaceas y Suculentas Mexicanas. volume 37, Number 3, 1992, S. 71–72. 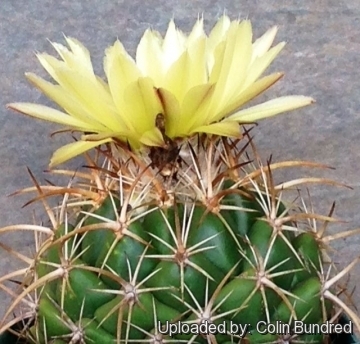 6) Reto F. Dicht, Adrian D. Lüthy: "A new conspectus of the genus Coryphantha." 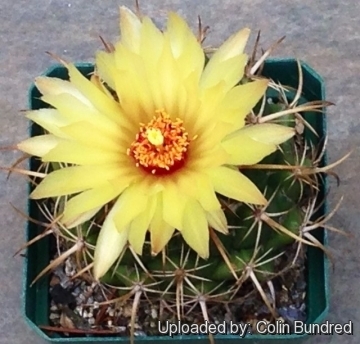 In: Cactaceae Systematics Initiatives. Number 11, 2001. 8) Arias, S., Zavala-Hurtado, A. & Hernández, C. 2013. 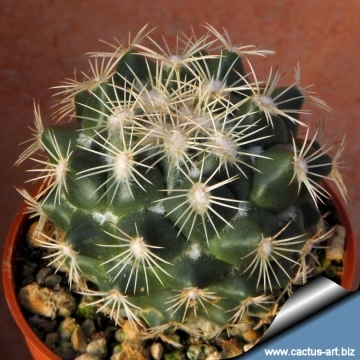 Coryphantha pallida. In: IUCN 2013. "IUCN Red List of Threatened Species." Version 2013.2. <www.iucnredlist.org>. Downloaded on 14 January 2014. 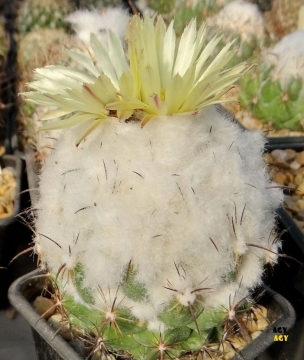 Cultivation and Propagation: In culture Coryphantha pallida subs. calipensis is without problems and regularly shows its large yellow flowers. 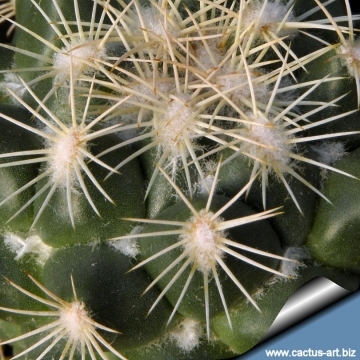 It is a summer-growing species of easy cultivation but sensitive to overwatering (rot prone).